Site last updated April , 2019. The musical instrument pickups, effects units and amplifiers designed and manufactured by Harry DeArmond and Bud Rowe and later by Steve Tosh in Toledo, Ohio, from the 1940s to the 1980s, through Rowe Industries Inc., H. N. Rowe & Company, Rowe DeArmond Inc., DeArmond Inc. and Tosh Electronics, all of Toledo, Ohio, USA. 1. This version has no metal tab on the side of the pickup head. Instead, the spring-like cable protector is extended as a straight steel wire along the side of the pickup head, terminating in a screwfixing to the pickup head; no clamp at the bridge as on later versions; instead, a hook arrangement attached to the 6th string; a cylindrical pot box with overlapping lid; the pot knob is domed, mottled brown plastic with milled edge, with slotted screw fixing to 1/4″ plain shaft of pot. Pickup interior. 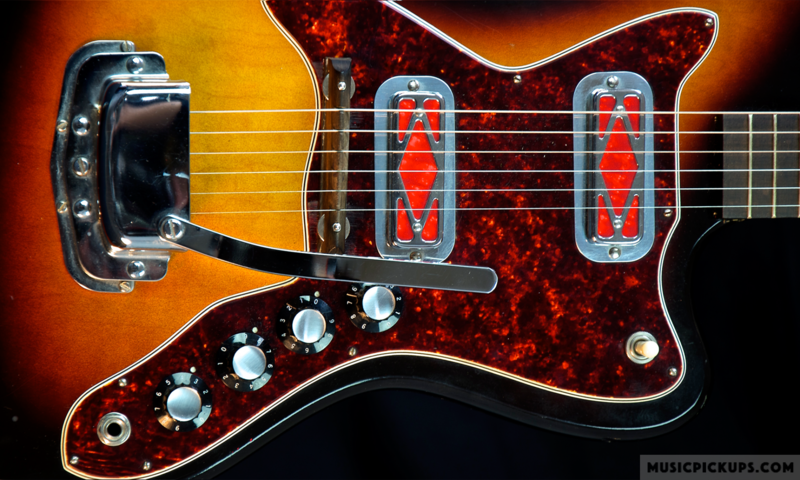 Note screwfixed paper-wrapped coil and extended wire arrangement to secure pickup under pickguard. Wire termination at pickup head, screwfixed. The pot box for this pickup is cylindrical with an overlapping lid; the knob is domed mottled brown with a milled edge, secured with a slotted grubscrew; the pot shaft is plain, 1/4″ Dia.. The pot itself shows the numerals 3601053. The pot manufacturer originally assigned the EIA code 360 is as yet unidentified. 2. This version has the metal tab on the side of the pickup head as seen; the pot is symmmetrical in plan, with an overlapping lid in chrome; a pot with a plain 1/4” shaft is used with a black ‘blunt’ chickenhead knob. 3. The Model FHC-B (B for ‘improved’ in terms of balanced output for all strings) single-slot version, otherwise as earlier pickup. This was the last version to use the metal spring-type cable protector. 4. The Model FHC-B, two-slot version with rubber cable protector, otherwise as earlier pickup, introduced in 1949. From now on, all FH pickups would have two slots. The two numbers stamped on some of the tabs denote the year of manufacture, in this case 54 for1954. 5. The Model FHC-C pickup. The C suffix denotes further improvements. The date stamp on the tab denotes the year of manufacture as 1959. 6. The Model FHC-C pickup. Patent Number 2455046 is shown. This patent Number was granted on November 30, 1948, and refers to the single-slot version, which at this point had been superseded.